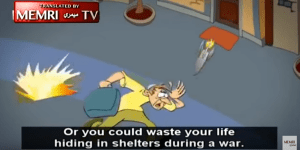 The Palestinian media this week released a deeply disturbing new music video with lyrics and images meant to serve as an explicit warning that Israelis should flee before the ‘martyrs’ “burn down Tel Aviv”. Entitled ‘Gather Your Things’, both the song and accompanying animations were produced by the Wa’ed band based in Gaza. The group posted the clip to YouTube at the end of November where it has since garnered more than 45,000 views. The Shehab News Agency uploaded the video to their official Facebook page as well, where it has been watched more than 73,000 times. 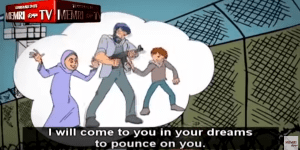 The animation opens with a Palestinian male, female, and child preparing their weapons for an attack, accompanied by the strident song, and the lyrics, “Gather your things, collect your children, and flee on the first plane you catch, or else your body parts will be collected”. A terrified Jew wearing a kippah (yarmulke) frantically empties his drawers and packs his bags quickly as he can. The Palestinian child enters the apartment riding a katusha rocket with a large smile on its face while the Jew cowers in his bed, and the adult male terrorist threatens to attack via terror tunnels, thereby showing the Jew that he cannot escape. The lyrics, “You left your country and came here to die on my land” are repeated several times as the man, armed with a Kalashnikov rifle, joins the woman and child surrounding the Jew, taunting him as he attempts to flee with his suitcase to no avail. He tries to escape as guns, axes and knives swirl around him but is then run over by a car as the song joyously describes the attack. Next, the Palestinian band takes a jab at the IDF, handing the animated Jew a diaper as he dresses in uniform, calling out “You, baby, run along to your mama”. 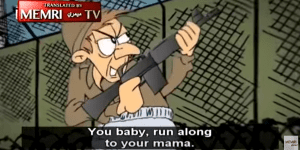 Though he attempts to proudly wield his gun in defense against the terrorist group, the presumed family nonetheless pounces upon the Jew, thus telling the viewer that not even the IDF can protect against their evil intentions. Again and again, the Jew tries to escape his pursuers with no luck: first he boards a bus which blows up, then he finds another seemingly safe vehicle but is confronted by the terrorist who is now wearing an explosive belt. Having given up on escape, the Jew returns home where his phone and computer are cyber-attacked by the monstrous group. Completely exhausted from running, the Jew begins to go insane. Medics prepare to take him to a mental hospital but along the way, he escapes and jumps aboard a plane, thinking he is safe at long last. 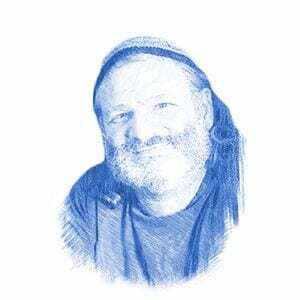 The video reaches climax when the Jew gazes from his window and falls in disbelief seeing the Palestinian flag flying over the Dome of the Rock on the Temple Mount. In October the same band released an original song praising bus bombings as an affective method to kill Israelis. These types of videos are popular among Palestinians and have a profound effect of rabid incitement on viewers. A recent report in The Tower, a monthly online magazine, found that 60 percent of Palestinians now approve of “armed attacks against Israeli civilians inside Israel”. The Middle East Media Research Institute (MEMRI), a non-profit organization dedicated to divulging the messages passed through Arabic media, translated the six-minute clip below.